You won't get too far jamming those tapes into a empty computer bay! Let us do the magic while you enjoy the memories. Watch all your home movies! Whether you've got VHS, Hi8, MiniDV, Betamax and most everything in between, we can get it running on your HDTV. Your videos are provided on DVDs in a free multi-disc case - the titles printed neatly on each disc. DVDs are convenient and we can make as many copies as you'd like, but let's face it, they get scratched or lost. Therefore, a universally compatible file version is also made available for local/online backup, sharing and editing. If there's TV or any other unwanted content, no problem - you won't be charged. We can also transfer PAL tapes for most formats listed above. In addition to our standard transfer services to DVD and M4V, we also offer uncompressed 10bit transfer and ProRes options for all formats. ProRes output may be requested at no additional charge for 8/16mm motion picture orders. 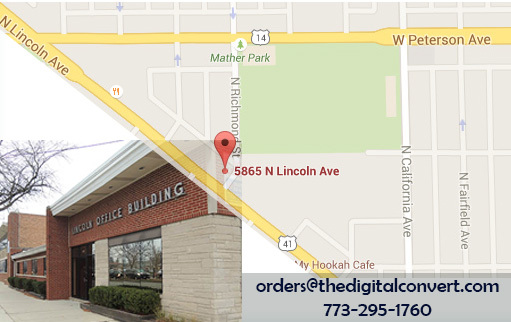 You will need to either provide your own digital storage or purchase from us to accomodate the higher file size. We're happy to work with you on any custom request. In order to request uncompressed output on our online order form, look for the checkbox titled "Display Advanced Options" and select "Yes" for uncompressed output. On the final checkout page, you may select "Add Custom Details" to add clarity to complex orders and make any other custom requests. Fiddling with that clunky projector just isn't cutting it anymore? 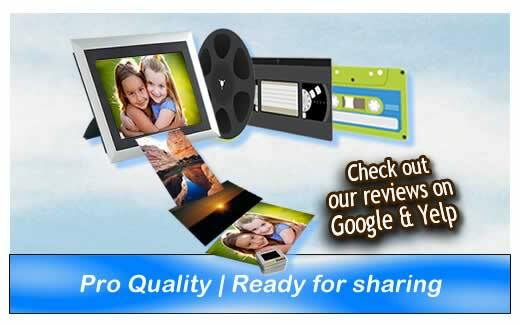 We can digitize your old Regular 8, Super8 and 16mm family movies once and for all for easy viewing and sharing. Files are available as digital files and playable DVDs. Thanks to superior technology, your transfers will be much higher quality than had you taken the leap years ago to VHS. Our HD 1080P transfers will give you far better clarity and color, imaging the film itself. Many places today still use inferior equipment to actually record a projection rather than capture the full quality inherent in the film. We recommend doing it right the first time! For even better quality, you might consider our wetgate option and additional post-production restoration for grain reduction, increased sharpness and dust and scratch removal. 1) Submit our order form online and enclose your email confirmation in your shipping box. Or swing by during walk-in hours. 2) Please arrange your videos in chronological order if possible. 3) Type and email title preferences to . Otherwise, we'll type up what's written on the labels. Can I email my video files? All charges are in one hour increments. A 30 minutes tape is billed for one hour of footage. A 15% discount will be applied for very short tapes. All listed cassette tapes can be converted to DVD on-site. We can transfer all your audio cassettes and reels for your continued personal enjoyment. Listen to your favorite hits or family history on your iPod, iPhone or PC. It'll be a blast! Just as with photo and video, we do our best to make the most of your originals. Wherever possible we use balanced audio connections and XLR cables to get the best signal from your audio recordings. We can adjust audio levels to ensure it's not too quiet or too loud (clipping), and also EQ your transfers to reduce noise and bring out voices. 2) Please arrange your tapes in chronological order if possible. Whether you need a short clip from your video, need to refine some raw footage or split your audio into unique tracks we're happy to help. Once your media is in digital format, we'll just need to know the desired start/stop times for each clip. This can only be done after the initial transfer process and is not a replacement for transfer services. All editing services are charged at an hourly editing rate in addition to any conversion costs. Highlight Reels - Coming Soon! If you're like many customers, you may be thinking "Wouldn't it be nice to have a bite-size version rather than hours of raw footage?" We can accomplish this through our basic editing service if you provide precise start/stop times of the best moments. Alternatively, provide a few pictures of the family members you'd like to capture most and the desired video length. We'll scrub through your footage for you and produce a nice highlight reel that's sure to be the best gift ever! 1) Play your DVD or file in your favorite media player. 2) Write the start and stop times for each clip you'd like in your video. Put this information in the "additional information" section of the order form. 3) Provide the desired title to be printed on your final disc. Costs: Custom editing is charged at an hourly rate. Ask for an estimate based on your specific job and provide a budget so we can keep you updated.